How Often Should I Water Garlic Plants? How Long Does It Take to Harvest the Garlic Plant? Can I Grow Garlic With the Bulbs I Bought at the Grocery? In urban gardens where space and conditions are limited, choosing the right plants for your growing area can greatly increase your success. A common problem in urban gardening is a lack of all-day sun. Many vegetables grow well in low sunlight and will thrive in a garden under those conditions. Explore vegetable varieties that grow well without a lot of sun. Garlic is an easy-to-grow vegetable that takes little sun and can be grown in cold areas. 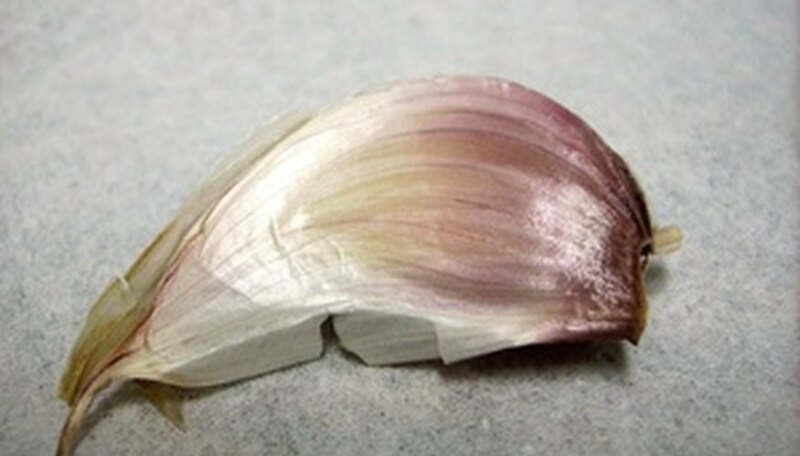 Softneck garlic, the variety from which garlic braids are made, is easier to grow than hardneck garlic, and softneck garlic lasts longer in storage. Broccoli grows well in the shade but requires a lot of space. According to Vegetable Gardening, broccoli grows best with 12 to 18 inches between plants and temperatures between 60 and 80 degrees F.
Mint is a popular garden vegetable that not require much sun. Mint is a hardy plant that grows quickly in well-ventilated soil. Popular varieties include peppermint and spearmint. Spinach is tolerant to cold temperatures and low light, so it grows well in places that don't get a lot of sun. Spinach grows best when planted 4 inches apart, and prefers temperatures under 75 degrees F.
Garlic needs moist soil throughout the growing season to properly mature. A thorough watering once every seven days should be enough to maintain proper plant growth. If your garlic does not get enough water during the growing season, it can result in small bulb size and decreased yield, according to the "Western Garden Book of Edibles." Stop watering your garlic plants once the leaves turn brown, which usually occurs two to three weeks before harvest. Over-watering of garlic leads to burst skins, splitting, mold and garlic that won't last long in storage. If you want to store your garlic through the winter, it is better to stop watering too soon rather than too late, according to Boundary Garlic Farm. It is important to monitor the amount of water your garlic plants receive throughout the growing season. Give garlic ample water during the growing season but stop watering completely before it is time to harvest. This will ensure a productive plant and a bulb that can withstand storage. Dig up the soil where you intend to plant the garlic clove. Turn it over and break it up as you dig to a depth of 8 to 12 inches. Garlic requires full sun to do well. Dig some compost into the soil. Reserve a little compost for later. Plant the garlic clove in the soil, about 2 inches deep. Make sure the pointed end of the clove (not including the sprout) is facing downward. Cover the garlic clove with soil, then with a few more inches of compost. Water occasionally, but not deeply. Keep the area around the garlic well weeded to prevent competition for vital nutrients. Mix the mineral oil with the finely minced garlic in a glass jar, and let the mixture steep for at least 24 hours. Strain the mixture and discard the garlic. Pour the garlic oil back into the glass jar. Stir the fish emulsion and 2 cups of water into the strained garlic oil, and then add the liquid castile soap. Pour the fish emulsion mixture slowly into the garlic oil, stirring as you pour. Mix 2 tbsp. of the fungicide with 1 pint of water and put it in a sprayer to treat affected plants. Garlic and mineral oil fungicide will keep for several months if you store it in a sealed glass jar. Place one large head of garlic in a blender or food processor. Add the water, vegetable oil, habanero or jalapeno peppers and whole lemon, and blend until the ingredients are finely chopped. Let the mixture sit overnight, and then pour it through a strainer lined with cheesecloth or muslin fabric. Mix 4 tbsp. of garlic and pepper fungicide with a gallon of water to spray on affected plants. Store any unused garlic and pepper fungicide in the refrigerator. Garlic repellents emit an odor that voles and other wildlife dislike. Repellents for voles don't show consistent results but can be worth a try, according to Sandra Mason from the University of Illinois Extension. 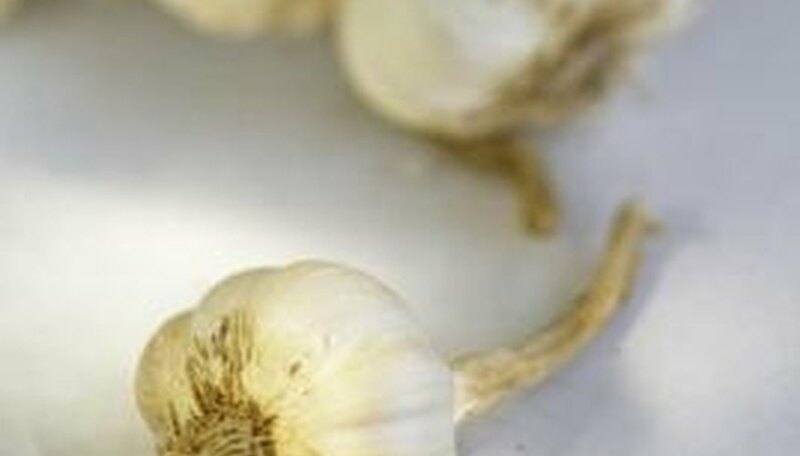 Place garlic in mesh bags and hang them on plants, or mix garlic with eggs, water and red pepper sauce and spray the mixture on plants at least weekly. A more expensive alternative is a garlic stick that can be attached to plants. Mouse snap traps work more effectively to control voles, Mason said. Bait traps with slices of apple or a mixture of oatmeal and peanut before placing the traps in the vole's runways. Prevent injury to other animals by placing a coffee can upside down over the trap, Mason recommends. Many northern gardeners like to give their garlic a head start by planting it in the fall. Mulched heavily, the cloves spend the winter under the snow, directing their energy into early root development. Once the ground starts to warm in early spring, small green tops have usually started to appear through the mulch. Garlic can also be planted as early in the spring as the soil can be worked, usually around February or March, but no later, since the plants require the full growing season to reach their maximum size before harvesting, which should occur sometime in August. Garlic is harvested once the tops have completely died back and the bulbs are tight and have not started to separate. The easiest way to harvest garlic without tearing the tops from the bulbs is to slip a trowel under them and lift them from the soil. 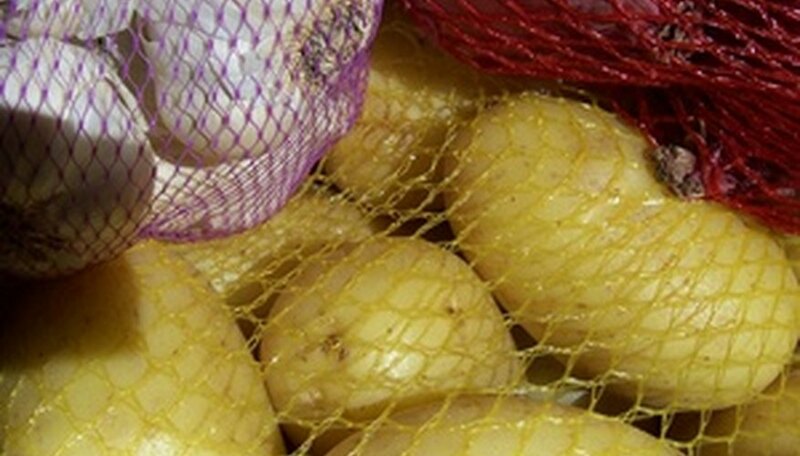 The garlic should then be placed out of direct sunlight to dry and cure before being stored in mesh bags, a process that can take several weeks, as the bulbs can be stored longer if they are completely dry. Garnish meals using chives. The flowers or leaves from the garlic plant can be used as a garnish similar to parsley. Chive leaves can also be chopped and sprinkled on top of salads, stir fries, and other meals to add a bold garlic flavor that doesn't overtake the dish. Stuff thick meats with garlic bulbs. Slice thick cuts of beef, pork or even chicken horizontally down the width of the cut to provide a small pocket inside the meat. Stuffing peeled garlic bulbs or chives into the pockets will help to infuse meat with a deep garlic taste. Adding a bit of oil to the recipe will help give your garlic a nutty flavor when it is being cooked with meat. Season food using these garlic ingredients. Either garlic or chives can be used in recipes such as garlic salsa or sour cream and chive covered potatoes. You can also crush or finely mince garlic bulbs or chives and place it inside olive or vegetable oil. Letting this mixture sit for 24 hours before using will provide a garlic infused oil. Use in soup and casseroles. Japanese miso soup uses chives in its preparation as an integral ingredient. Be sure to add chive leaves within the last 5 to 10 minutes of cooking as this helps to prevent flavor degradation that occurs with higher heats. Add to your favorite homemade bread mixture. Breadcrumbs used in meatloaf recipes can be seasoned with garlic or with garlic chives depending on the strength of flavor you want. Adding garlic to your favorite bread mixture to be baked will give it a pronounced flavor. Garlic bulbs will be stronger and more pronounced in flavor than the chives. Place the seed garlic (cloves) into a large bucket. Pour a gallon of lukewarm to warm water over the seeds. Add a tbsp. each of baking soda, liquid seaweed and white vinegar to the water. Leave the seeds in the solution to soak overnight. Remove the seeds from the solution in the morning. Soak the seeds in rubbing alcohol for four to five minutes. Remove the seeds and wipe them off gently with a paper towel. This is best done outside as the smell can be quite strong. Layer organic material onto the garlic bed at a rate of 2 bushels per 100 square feet of bed. Broadcast 3 lbs. of 10-10-10 fertilizer per 100 square feet of area. Work the material into the soil with the rototiller. You can also dig the material into the soil using a shovel, if no mechanical means are available. Separate the garlic bulbs into individual cloves. Each small clove will grow into a large bulb, exactly like the planting bulbs you are separating. Plant regular garlic with the individual cloves approximately 5 inches apart, in all directions, in the growing bed. Cover the bulbs with ½ to 1 inch of soil. Place elephant garlic at a greater spacing between each clove. Set the cloves in rows that are spaced 18 to 20 inches apart. Plant the individual cloves in those rows 8 to 10 inches apart. Cover with soil 1 to 2 inches deep. Mix garlic, lemon juice, soy sauce and pepper for the dressing. Toss with lettuces and tomatoes. Do not use garlic (Allium sativum) bulbs from the grocery store for gardening. Commercial growers often treat garlic grown for grocery stores with chemicals for sprout prevention, according to the National Sustainable Agricultural Information Services. 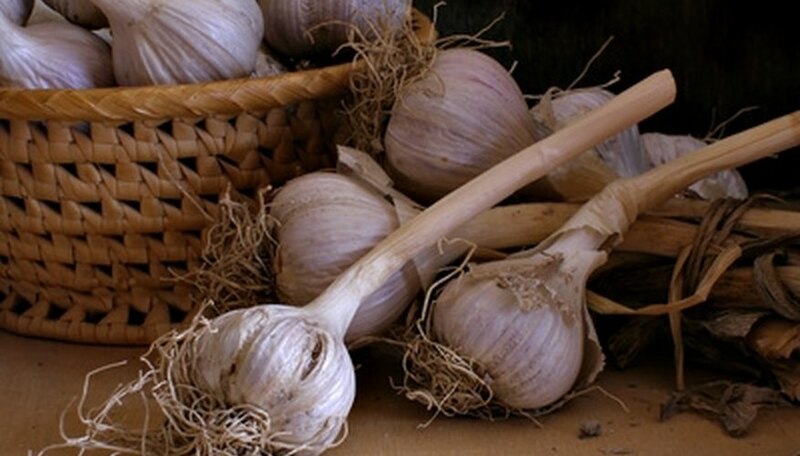 Purchase garlic bulbs from regional gardening suppliers for garlic gardening success. Separate the individual cloves that make up the garlic bulb. Plant each clove in a separate container. Fill a 12-inch-deep container to the top with potting soil. Make an indentation in the center of each container for a garlic clove. Place each garlic clove into the prepared container, with the pointy ends of the cloves facing up and approximately 1 inch below the surface of the potting soil. Cover the garlic cloves with soil and tamp the soil down firmly. Water the garlic cloves immediately after you plant them. Place the containers in a sunny location. If you do not have a location with direct sun, place the containers beneath a grow light and leave the light on for approximately six hours out of every 24-hour-period. Water so that the potting soil remains evenly moist and watch for garlic shoots to grow from the soil within approximately one week. Trim these shoots from the garlic cloves, if you desire. 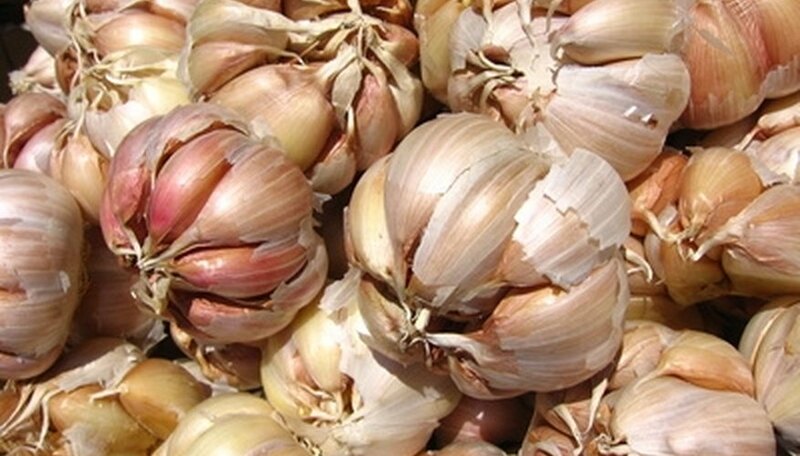 Harvest garlic bulbs when the foliage above the soil turns brown. Pull the bulbs out of the container gently.